I remember my first cloth nappy well, it was a TotsBots Easyfit v2 Cosmic. I loved the bold print, how easy it was to use and cute it looked on my three month old son’s bottom. That was over five years ago now and that same Cosmic Easyfit has been worn by all four of my children and is still going strong. Using cloth wasn’t a decision that I made during pregnancy, it was something I discovered a few weeks after my son was born and it took me a little while to build up a stash and the confidence to use them full time. When I found out that I was pregnant again, my firstborn still only nine months old, it was cemented that this was a decision I needed to commit to, for the sake of the environment, my bins and my wallet. Nowadays my big two are out of nappies completely, but my youngest two are still in them full-time and we have a colourful stash that they share. (One of my favourite things about Easyfits is that they fit both of them so well). During my five years as a cloth bum mum I have learned a lot, so I thought I would share my top tips for anyone just starting out. -It is never too late to start, especially if you are thinking of having another baby in the future. Wearing cloth nappies can help children to potty train earlier and every disposable nappy saved from landfill is a victory. We didn’t use them from birth with our first but we have certainly got our money’s worth! -It doesn’t have to be all or nothing, we started out just using cloth at home and only in the day-time. Every cloth nappy you use, saves you throwing one away so starting small and slowly building up is a great way to build it up. -Meconium is black and sticky, but it washes out easily without leaving a mark. With our third and fourth babies we used cloth from the very first day and their TeenyFits still looked pristine when they were retired at a few months old. I loved knowing that they weren’t exposed to any chemicals in those important early days. -The key to making cloth work is your system. We have a lidded nappy bucket and wash every 3 days. I put on a cold wash in the early evening and then set the machine to do a hot wash overnight so that I can hang them on the line in the morning. It soon becomes second nature and those two or three extra washes a week are barely noticeable. - The sun is magical - you may take a nappy out the washing machine and think it looks horrible and stained, but hang it to dry in the sun for a couple of hours and chances are it will be pristine and white by the time it is dry. Line drying is best for nappies as the sun acts as a natural bleach (also try this with baby clothes stained with explosive pooplosions). 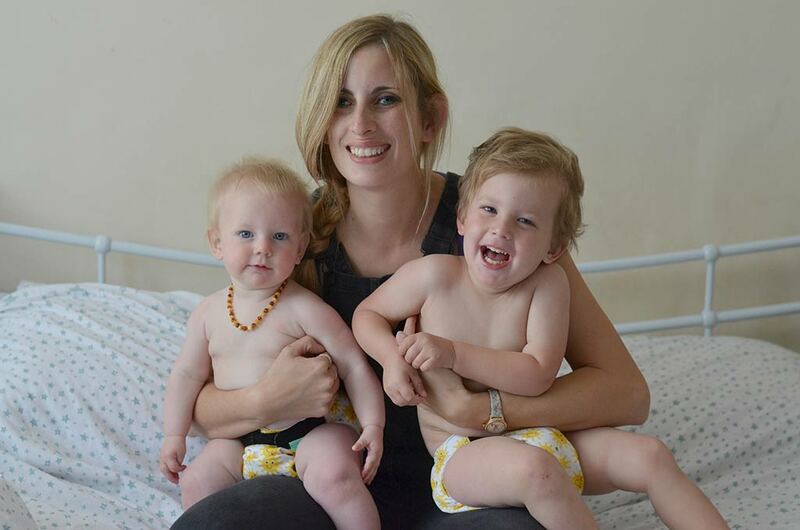 Buying that first cloth nappy all those years ago has diverted thousands of nappies from landfill, saved me hundreds of pounds and helped minimise the chemicals my babies are exposed to. We won’t be having any more babies but I know most of our nappies will be passed on once our youngest potty trains - except for that Cosmic V2, I think that one is a keeper. You can read more about the lovely Becky and what it's like to have 4 under 5 over on her very own blog, The Mummy Adventure.